The SV-330 Series has been discontinued. Please contact our Flow Engineering Department for possible alternatives. 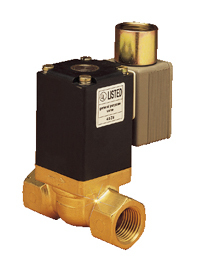 SV-330 Series 2-way solenoid valves are direct-acting, featuring an epoxy-encapsulated coil, a brass or stainless steel body, and Viton® seal material. The -10 to 130°C (14 to 266°F) temperature range is ideal for neutral media such as compressed air, water, oils, and greases without additives (viscosity of approximately 2.3 x 10-4 ft2/s). Electrical connection is by conduit plug. Closing Time: 20 to 30 ms Times measured at outlet A on energizing/ de-energizing until attainment of pressure rise to 90%/pressure drop to 10% at a working pressure of 85 psi. Comes complete with operator's manual.